Is this operating system an enlightening Linux experience? This is an incredibly lightweight OS, pulling off its streamlining without losing out on functionality. This article was provided to TechRadar by Linux Format, the number one magazine to boost your knowledge on Linux, open source developments, distro releases and much more. It appeared in issue 219, published January 2017. Subscribe to the print or digital version of Linux Format here. 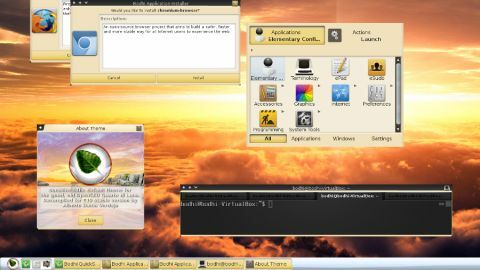 Bodhi Linux is a lightweight Ubuntu-based distro that appeared on the scene back in 2011. Its system requirements are among the lowest out there for any desktop Linux flavour. It can even run on a non-PAE CPU with 128MB of RAM and a 300MHz processor. We didn’t have one of those lying around, but we did have a pretty old and dusty PC which we could test it on. The OS boasts a simple Ubiquity install process (just like you get on Ubuntu) and it’s a thoroughly usable, and not at all bad-looking, distro. Bodhi is based on Ubuntu 16.04 LTS, so we get Kernel 4.4 and all the stability of that system. Unlike Ubuntu though, a fresh install occupies a mere 2.5GB. The space savings come from eschewing Unity in favour of the Moksha (which means ‘release’) desktop and bundling only the essentials: terminal, text editor, file manager, photo viewer, and web browser. A larger AppPack ISO is available which includes LibreOffice, VLC and Pinta etc. Moksha uses a forked version of Enlightenment E17 (current version is E21), which has an illustrious history among desktop hackers. All the bundled apps use the Enlightenment Foundation Libraries (EFL) rather than GTK or Qt etc, so they have a unique yet consistent look. Traditionally, lightweight has meant sacrifices in usability, functionality or desktop niceness. Not so for Bodhi. There are no mandatory keyboard shortcuts to learn, USB drives don’t need manual mounting and a fair few campers would claim Moksha looks much better than Unity. The Midori browser (of Raspbian fame) may not be to everyone’s tastes, but it is one of the best light browsers around. Likewise PCManFM – borrowed from LXDE – might be too simple for some people’s file managing requirements. The Ubuntu repos are, of course, full of chunkier alternatives, but these will take their toll on older hardware. We were particularly fond of Terminology. The default set up with the Terminus font and pulsing cursor looks modern, plus there’s the awesome visual terminal bell effect. But wait, there’s more – terminals are all the rage, but have you seen one that can divide horizontally and vertically? [Yes, it’s called Terminator – Ed]. There are also some feedback effects when mouse buttons are pressed or when moving or resizing windows. Bodhi retains some nice features from the previous release too: the polite reminder that Presentation Mode exists when the screensaver is disarmed quickly, and support for apturl:// URIs (so that packages can be installed from the web browser). The Moksha desktop environment can also be thoroughly customised through the addition of Modules. These are little gadgets that provide application launchers, volume and backlight controls, and a system tray. Modules live in containers called Shelves, and the default setup comprises a single shelf at the bottom with a menu, desktop pager, application list and other things we’d expect to find there. Additional shelves with more widgetry can be added around the edges of the screen. This makes extensive personalisation possible, but can seem clunky at times. It perhaps isn’t quite suitable for beginners, but Bodhi Linux is one of the nicest gifts you could give your old hardware.